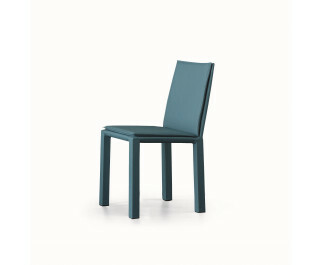 Strong shapes for a chair without compromises. The simple and strict shapes of the Kuva padded chair can be embellished by a soft cushion for a more comfortable seat (Kuva soft). It is entirely upholstered with eco-leather or leather covers and it is also available in the version with a wider seat (Kuva large or Kuva large soft, with cushion) or with wider seat and armrests (Miss Kuva large or Miss Kuva large soft, with cushion).